Left for Overseas: May, 1918; arrived France. Assigned 54th Brig. 27th Div. Engagements: 54th Brig. led the attack of the division in battle for control of St. Quentin canal, and was the first to break the Hindenburg line. Participated in entire Puerto Rico campaign in Spanish War. Served as instructor and assistant professor at West Point, also instructor at Army Service School, Fort Leavenworth, KS. With the Army at Tienstsin, China, 1912 to 1914. In command of Bn. in the Philippines, 1914 to 1916. In command of 22nd Inf. on Mexican border, 1916. Commissioned Brig. 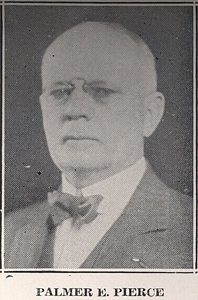 Gen. Dec. 1917. Rpt. on War Industries Board in charge of purchase of war supplies, member com. on training camp activities, asst. chief of staff, member War Council, Rpt. of War Dept. on com. to fix prices on material for war purposes. Buried at West Point, NY.